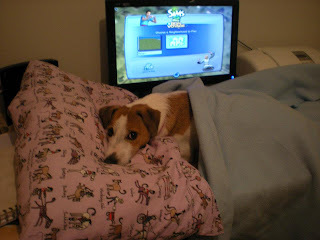 So it's always been a joke in the family that Saffy's a bit stupid, even for a Jack Russell. She's took a long time to master how to play fetch, she has trouble remembering more than four or five commands and she's walked into doorframes countless times through being too excited. But today, I decided it was time to clear it up, once and for, all- is Saffy stupid for a dog? I looked up 'Pet IQ tests' on google, and got a suprising number of hits. 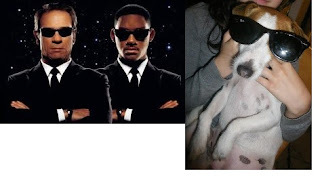 I picked out two that looked fairly sensible, found Saffy and got to work on testing her. It began with a couple of questions about behaviour: How does she act when I come home after being away all day, and does her behaviour change when she's been naughty? She scored highly on these, she's very affectionate when we get home and she does know when she's been naughty, although maybe doesn't always know why. The first task she had to do was get a piece of food from underneath a cup, having seen me place it there. I had actually done this before with her as part of a biology experiment on learned behaviours so I was expecting her to do well. Unfortunately she scored the lowest possible score by failing to retrieve the food. She knew it was there and sniffed around, but it didn't occur to her to knock the cup over so she gave up. I was hoping that with the second challenge she might redeem herself. This involved placing a blanket over her head and seeing how long it took for her to free herself. It wasn't a great result- she didn't really care that she was under a blanket and just stood up to carry on playing with her toy. It fell off after about 30 seconds so I didn't give her the lowest score, but I don't think she was really trying to get out at all! Then we had to test her reactions to words to see if she knows her name. Unfortunately, she seems to think that 'refrigerator' and 'movies' are her name, whereas 'Saffy' is just some random thing that comes up in human conversation. At the end of two IQ tests, Saffy actually came out as average. She's no genius dog but apparently she's not so stupid after all. I think she just applies her intelligence selectively! "If I can play Monopoly, I must be pretty smart!" Firstly, sorry that there hasn't been a post for a long time. 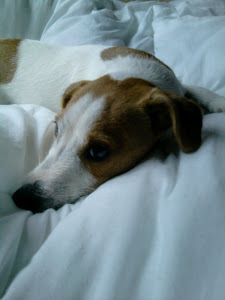 I got a bit distracted watching the Olympics and then haven't had time to get back into the blog! Anyway, on with the post. 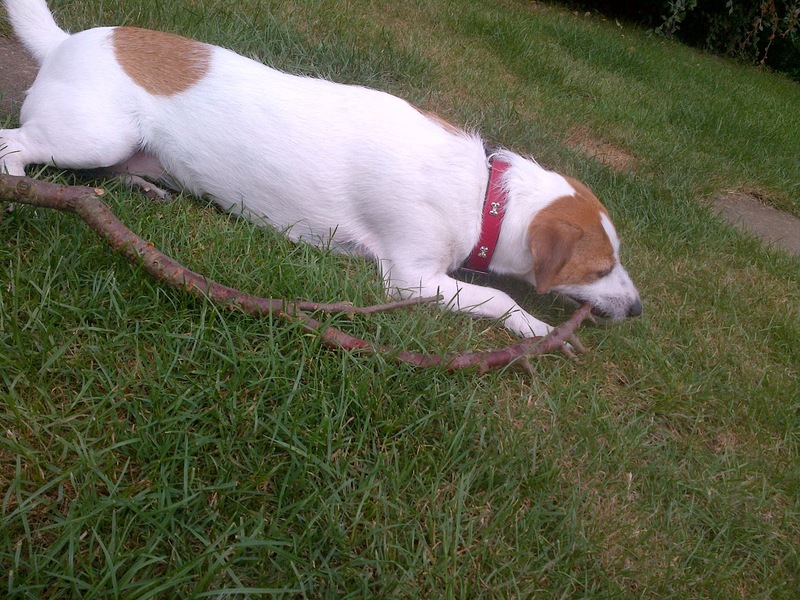 I've just returned from taking Saffy to the park where she found a nice, big stick. 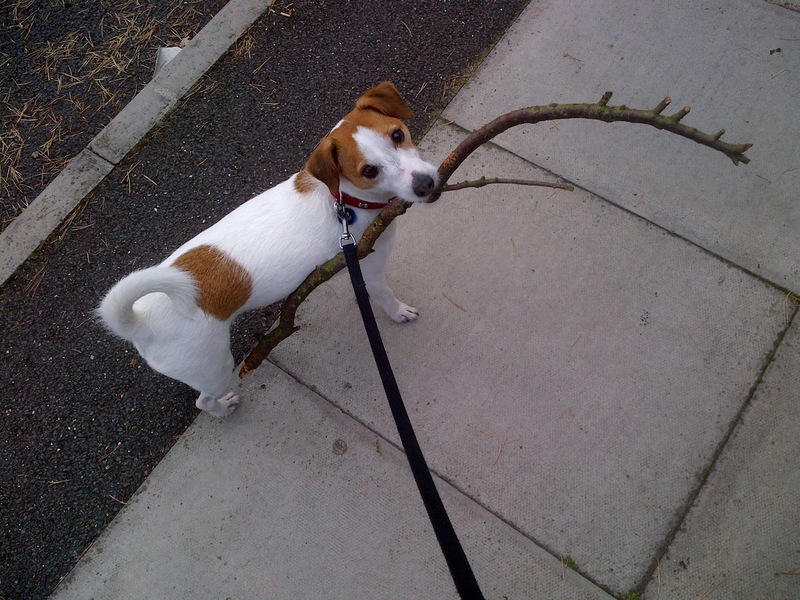 In fact, she liked it so much that she decided she had to bring it home. So there we are, walking out the park- me, a little dog and a giant stick. At the gates, a lady came through on a bike, looked at Saffy and laughed. 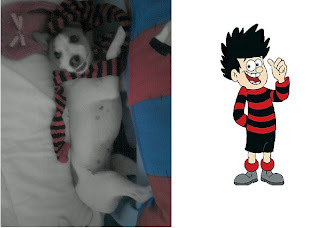 It wasn't just me who thought my dog looked ridiculous! Then our route home goes alongside a busy road. (Fortunately we didn't have to cross it. When we do, I don't let Saffy carry things home because she has a habit of dropping them and trying to stop and pick them up.) There were certainly a few cars with people slowing down to point at Saffy. We also passed by some pedestrians. Luckily all the pavements here are quite wide, so Saffy didn't bash into anyone with her stick. I was actually suprised that she kept hold of it all the way home. It's only a five minute walk, but usually she forgets to keep whatever she's carrying in her mouth. 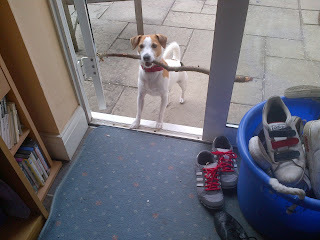 I had to bring it through the front door for her because it's wider than the doorframe! Today's stick- twice the length of her, maybe?! Trying to bring it back inside! 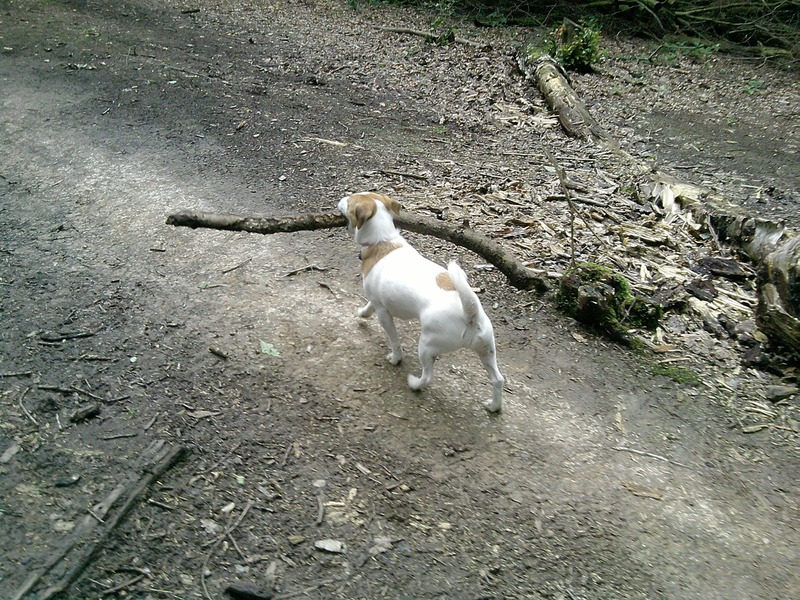 More of a branch than a stick. This one didn't get out of the woods though luckily- I think she got too tired! 10.40am Wake up. It’s a Saturday, and the first day of the summer holidays which means that I can have a nice long lie in. None of the owners need to be anywhere early, so they’re happy to just leave me to snooze. When do I get up, I head straight out into the garden. Appropriately for the first day of summer holidays, then sun is out- perfect for sunbathing! I settle myself on the nice warm patio. 10.45am Whilst I’m soaking up the rays, Jenny is making my breakfast. I sometimes have a little trouble controlling my bladder when I get really relaxed and sleepy, so every morning I take a drop of medicine with my food. Actually- I don’t even notice it’s in there! 11.00am I play fetch with Jenny and Alice (that’s Jenny’s sister by the way!) I’m getting really good at it now- I can catch the ball when it bounces, and I have learned to drop the ball for them so they can throw it again. I play for a little while, until I start to get too hot. 11.15am I get to meet the dog from next door. The past couple of days I’ve spotted a pretty Weinmaraner in the next garden, but despite all my barking at the window, she hasn’t taken any notice! But then the neighbour came round today to introduce us- turns out they’re looking after her for a short while. She’s 9 months old and seems nice and friendly, so now maybe I can stop barking at her. 11.25am Time for a quick nap in the pool of sunshine on Jenny’s bed. I like to sleep here in the day because it’s always warm by the window in summer, and by the radiator in winter. 12.00pm Walkies! I get into the car (which always means it’s going to be an extra good walkies) and we go to the local lido which is like a big lake for me to swim in. To get to the bit where dogs are allowed, we have to go through a field with long grass in the middle. Jenny and Alice went round one way, and mummy went the other. I tried to run between them, but got a bit lost in the middle- the grass was way over my head. I had to jump right off my feet to find them all again! Then we got to the lido and I ran straight in. For some reason, my owners don’t trust me not to swim out too far (I wouldn’t!) 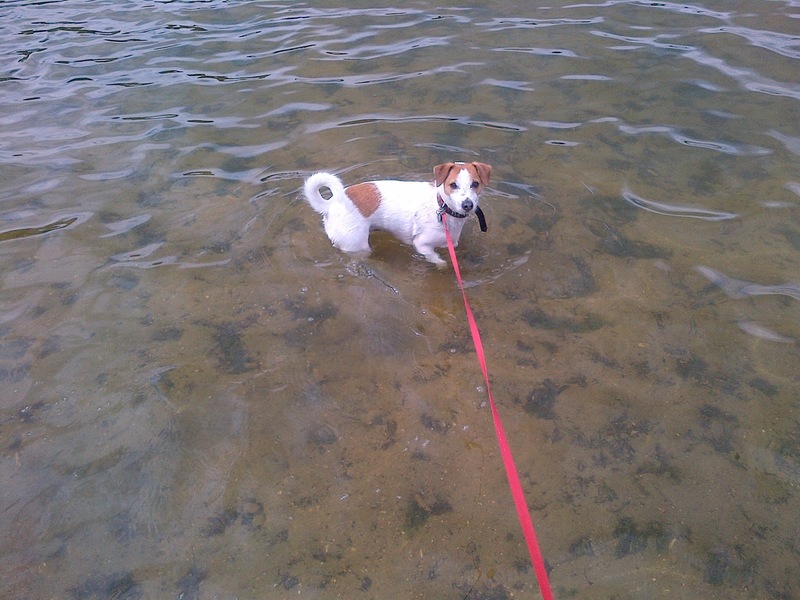 so I swim on my extendable lead. I chase after sticks in the water and even stick my head right under. There are some bigger dogs here who keep getting too close to the swans, so I bark to warn them to keep away from those nasty birds! Then a little dog comes over who doesn’t want to swim at all- she keeps running away from the edge, too scared to get her hair wet I think. I try to show her how good it is to run in and out of the nice cool water, but she’s having none of it. I want to swim all day, but my owners make me leave, even though I bark and whine in protest. Then I settle back down in the car to go home. 4.00pm After sleeping for a few hours, it’s time for my ‘Garden Security Shift’. I’ve taken it upon myself to keep the garden free from birds, squirrels and cats by patrolling the hedges, barking loudly and chasing any intruders. It’s a tough job, but someone has to do it. 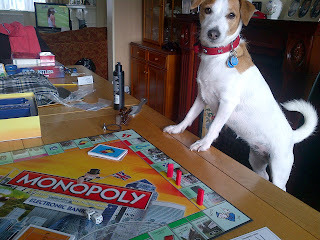 6.00pm My owners go out for dinner, leaving me to entertain myself. I like to keep them a bit on edge by pretending that I do crazy things like run around, and break stuff but to be honest that all just takes too much energy. I make the most of the peace and quiet for a good sleep. 8.15pm Quick check on the garden again from an upstairs window. Nothing to report, all looks very quiet out there. 9.30pm Settled down for the night on the comfiest bed I can find. Tonight that's at the end of mummy's bed. 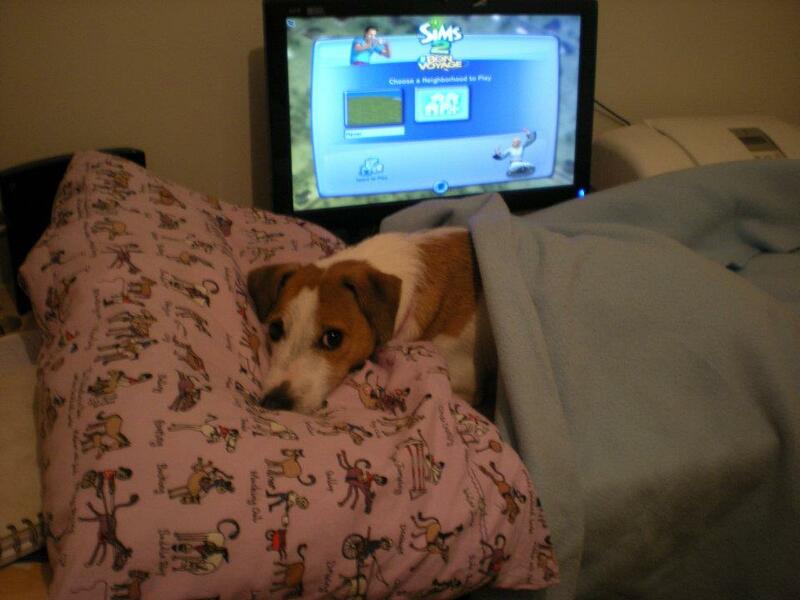 Besides walkies, chasing birds and fetch, one of Saffy's favourite ways to pass the time is a good sleep. So here are a few photos catching her catching 40 winks! Saffy’s a very lucky little dog who has plenty of toys to play with, and she can often be seen carrying one of them around the house with her. In this post I’m going to tell you all about the toys she loves, and how we keep costs down when it comes to getting them. Now Saffy is very destructive. We think this could be down to the fact she’s a terrier, and so she instinctively has to tear her toys apart. 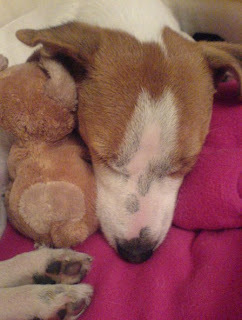 When we first adopted her, we bought a small soft toy with a squeaker in it from a pet shop. As a puppy, she loved this little toy and it lasted her a couple of months before she learned to pull it apart. But once she’d figured out that toys come apart, she went through them very quickly! She has a method for doing it now- with teddy bears, the eyes, noses and ears come off first before she gets to work on finding the seams to pull apart. Something we also had to deal with was teaching her what she was and wasn’t allowed to play with. Things that were on the floor were ok for her to take, but toys from beds or put up high weren’t allowed. She actually learnt this very quickly, and will even lie on my bed alongside soft toys without picking them up. Occasionally there is the odd accident when something is left in her reach- she did manage to chew up half my sister’s Sylvanian collection. This was just something we had to accept though, that if we were going to encourage her to play with toys we had to be careful about leaving things out. Other people that I know have gone the other way to protect their things by not having toys for the dog other than maybe some balls. We started off by buying toys from pet shops, but soft toys especially didn’t seem like all that good value. They could be expensive for what they were, and often were designed to be torn apart easily- Saffy could destroy one within about an hour. Instead, we took a trip to the local RSPCA charity shop which has a well-stocked soft toy bin. The toys are almost all priced at under £2; in fact most of them are only about 50p. Obviously not everything is suitable for dogs and I do spend some time choosing the ones that are most appropriate for Saffy. What she really likes is toys that have lots of bits to pull off- so teddy bears with clothes on and holding things are great! I also like to choose ones that aren’t stuffed with beans- she got hold of one of mine once and it took FOREVER to clean up! The white stuffing that many toys have is annoying, but believe me, it’s much easier to tidy up. I like the fact that when I buy Saffy a toy from the RSPCA shop I’m helping more animals as well. Other things Saffy loves to play with are tennis balls. We used to have a great supply of these because our neighbours had a lovely dog who would find the discarded ones from some nearby tennis courts. They would come back from walks and leave them outside their house for us to help ourselves to. Unfortunately though, their dog became ill and had to be put down a while ago. 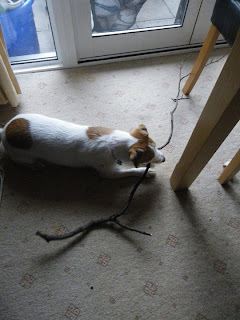 I do sometimes use one of those flinger sticks for tennis balls with Saffy, but we have had some problems with those because she gets very overexcited, and also barks at people in the park who have them. I might do a separate post in the future specifically about this so that people can share their own advice about it. Just to add- I did spot an article online about tennis balls maybe causing damage to dogs’ teeth if they’re getting wet and dirty. So from now on, I will be making sure to change her tennis balls regularly to look after her teeth. Recently Saffy has taken to chewing holes in her tennis balls. Seeing as they don't bounce very well in this condition, I decided to try and find another use for them. I put some treats inside the tennis ball, and then put it into an old sock to stop them falling out. Saffy spent ages chewing at the sock to get the treats out- I don't think she's ever been kept occupied for so long before! 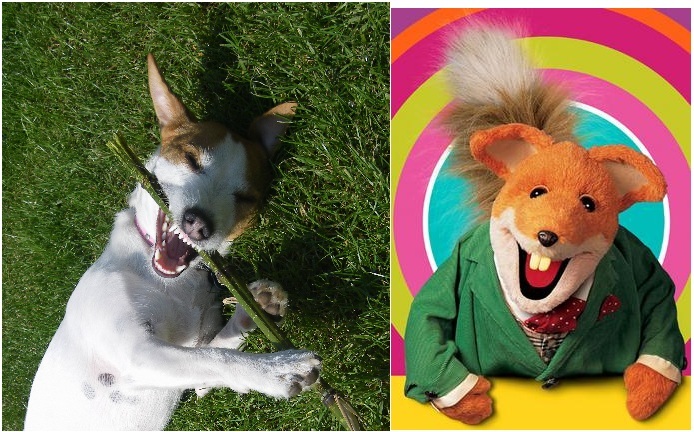 Now they say that dogs look like their owners, but Saffy's got rather a few lookalikes! 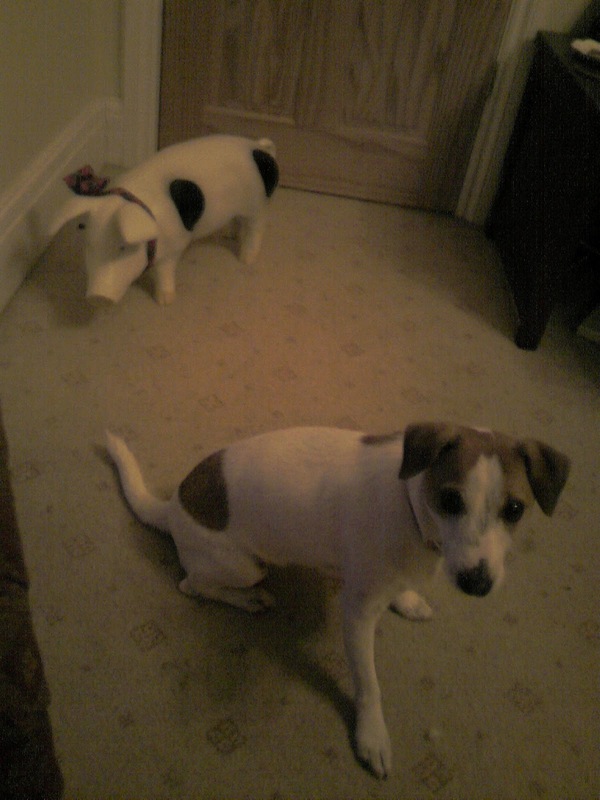 This pig was bought on a holiday and is now the source of much confusion in the house! 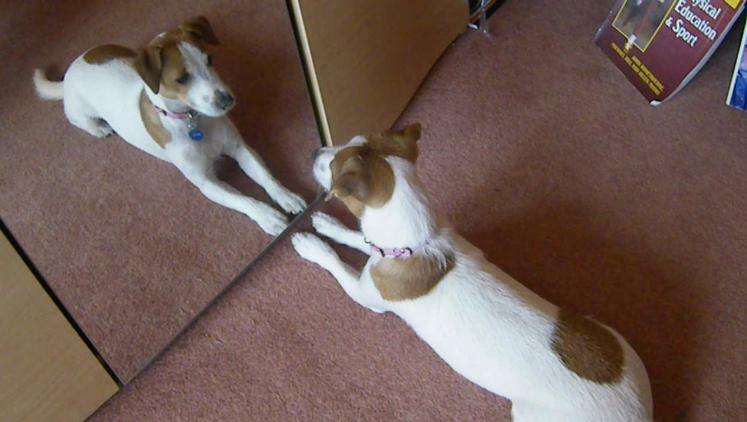 When we first got Saffy, we made sure to socialise her really well with other dogs. We went to the park nearly every day and she got to play with many of the other friendly dogs in the local area. I introduced her to big, small, young and old dogs- those who love to play, and those who would rather amble slowly round the park alone. Older dogs would discipline her when her puppyish behaviour was unacceptable to them. She soon learnt to play nicely, and to leave dogs who don’t like to play. This worked really well and Saffy enjoyed being chased around the park (she much prefers to be chased rather than do the chasing!) and the occasional bit of rough-and-tumble play. She sorted herself into the doggy hierarchy very quickly. She’s quite a submissive dog and doesn’t enjoy too much wrestling. When she’s had enough she rolls over -a sign to the other dog to let her up. If this doesn’t stop play, then she gives a small yelp which is usually enough. 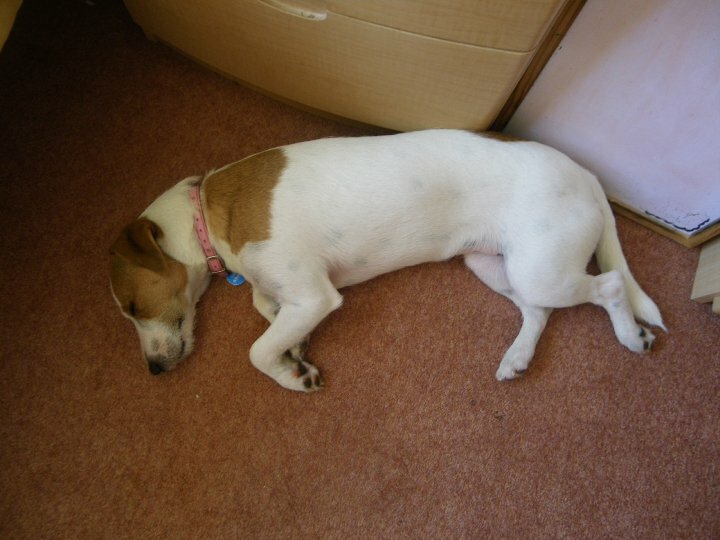 However, about two years ago Saffy had a couple of incidents which have made her wary of other dogs. The first was playing with a large greyhound. Saffy might be small, but she easily outruns most of the dogs we meet. This one though could catch her up easily and was very quick to pin her down. After a couple of times Saffy decided she’d had enough of this so she stopped running and lay down. The greyhound was determined to keep playing despite Saffy’s protests. She was exhausted from running away so I put her lead on and picked her up. The owner of the greyhound did realise what was going on and caught her dog to give Saffy a bit of space. The other incident was with a pack of about 4 or 5 West Highland Terriers. I come across these dogs in one of the local parks quite often. Most of them are friendly, but there is one who growls a lot at other dogs. One day they were all sniffing Saffy and the least friendly one actually nipped her and drew blood. With both of these things happening, Saffy got very nervous about other dogs- particularly big ones. When we go to the park, I still make sure she gets to see other dogs, but she likes to make sure I’m nearby before she’ll go up to them. She does still play, especially with dogs her own size, but I have definitely noticed a change in her. I think she’s getting better again with other dogs, some days she doesn’t display any nervous behaviour but she is still not quite back to normal. Today we went to the park, and as we turned down the footpath to go in, a big Golden Retriever growled at Saffy. Both dogs were on the lead and the owner of the other dog did hold her dog back from Saffy, but I think it scared her still. When we got into the park, a large German Shepherd was coming towards us. I see this dog often and I know he’s old and gentle but Saffy actually sat down on the path and wouldn’t move. The German Shepherd came up to her, they sniffed each other and all was fine although even once they’d gone Saffy wasn’t very keen to walk into the park. We came across quite a few more dogs this morning and she did tolerate all of them coming up to her, although she spent most of her time crouched to the floor with her tail between her legs and her ears flat- Saffy’s signs that she’s frightened. She did, however, find a lovely old man who stroked her for a couple of minutes- I think she’s decided that humans are far more pleasant than dogs!